It can be difficult to land a new job. There are not that many openings, which makes it even more competitive for the positions that are available. If you worry about not getting noticed when you apply for your next job, focus on making your resume as strong as possible. Your resume is what catches employers’ attention and demonstrates your skills and qualifications in a compact package. It is more important than ever that this document is strong, especially since most employers only spend six seconds reading each one. Using chemistry resume templates is a great way to begin. This guide explains everything you need to know, from writing tips to finding useful resume templates. Why Use Chemistry Resume Templates? Because the chemistry field is so competitive, a common strategy is to start out as an intern. Of course, you will still need a resume even if you are applying for an internship. After working an internship, you will have a good chance at a permanent position. Find the best resume templates to suit your unique needs. As demonstrated in all these chemistry resume templates, shorter is often better. If you have more than 10 years of working experience in chemistry, you can have a longer resume. Otherwise, it is best to stick to only one page. Longer resumes discourage employers to read the entire document, which hurts your chances of getting the job. One of the most effective qualities you can communicate in any resume for a position in chemistry is professionalism. It is important that anyone hired is mature and skilled in the lab. There are chemistry resume templates available to demonstrate how to emphasize the professional aspects of your skills and experiences. 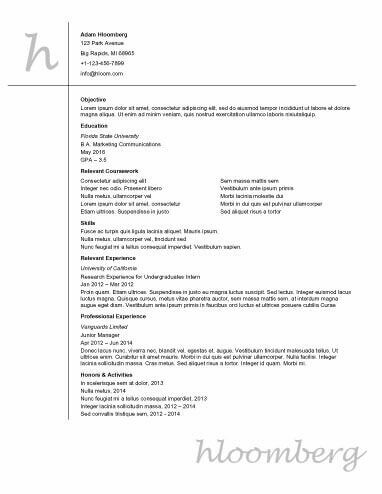 Check out this list of resume templates. Chemistry is a constantly changing scientific field. While some aspects will always stay the same, demonstrating that you understand modern science and many of the new dimensions that have only developed in the last few years will portray you as a highly appealing candidate. Writing your resume with a contemporary angle is a good way to capture this aspect. Your resume will be different depending on whether you are an undergraduate student or a graduate. Chemistry resume templates are available that reflect both situations. Chemistry is a wide field, which means there are desirable positions available at all experience levels. Of course, the majority of job openings require candidates to have completed at least a bachelor's degree. Begin your resume with information about how readers can contact you. You should always include your full name, email and mailing address, and phone number. Make sure your email address is professional and respectable. The first section of your resume should be a summary that gives a brief overview of the rest of the resume. Think about what each individual employer wants to see to appeal to their unique expectations. The summary should be about three sentences or three bullet points long. The summary should usually not mention your objectives. Though employers once expected this, it is no longer necessary on a resume, except in rare cases, such as when you are changing careers. Describe the skills you have that immediately relate to the position you are applying for. Do not include any skills that are irrelevant. Keep this section brief so employers can scan through it in only a few seconds. Mention skills that appear on the job description. As the most important section, the work experience information should be the most extensive part on your resume. Describe your daily responsibilities and actions for previous positions in as much detail as you can. Begin every bullet point with a strong action verb. Begin with your current position, which should be in present tense. Then list the rest of your previous jobs in reverse order, each in the past tense. Each position should generally have between five and eight bullet points. It is okay to have more or less depending on how important each position is. The education section should be the shortest in your resume and only include the basic information, including school, degree type, and date of graduation. Unless the employer specifically requests it, you should not mention your GPA or any individual grades.